If you love green mangoes or raw mangoes or kairis, you have got to try these healthy snack recipes. Green mangoes are in season. Did you know that green mangoes or raw mangoes can help boost your immunity and digestion and keep your blood pure? Make use of them by making these delectable snack recipes by Maharaj Jodharam Choudhary, Corporate Chef, Khandani Rajdhani, to have them with your evening chai. 1. Grate raw mangoes and blend it with one cup of buttermilk and keep aside. 2. Take a bowl, add maize flour, ginger garlic green chilli paste, semolina, besan, salt, mango puree and remaining one cup of buttermilk and keep aside for 30 minutes. 3. Grease a pan to steam the batter. 4. If you feel the batter is thick after 30 minutes add some more buttermilk. 5. Add a ½ tsp of fruit salt with one tablespoon of water and mix well it with the above batter. 6. Pour the batter into the greased pan and steam immediately for 15 to 20 minutes. 7. Heat oil in a pan, add mustard seeds, asafetida powder. Pour over the prepared dhokla. 9. 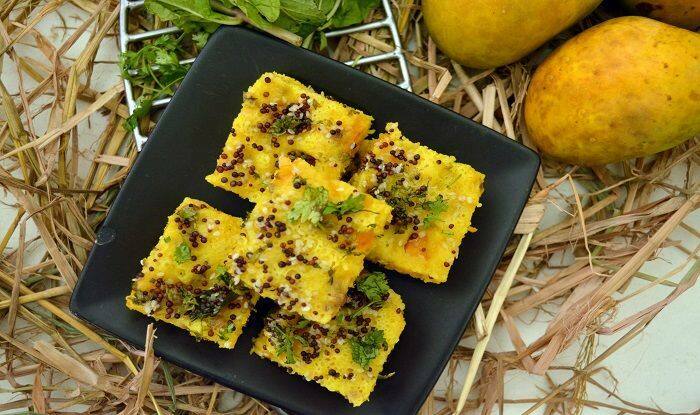 Mango maize dhokla is ready to serve. 10. Serve with coriander chutney or sweet chutney. For the mixture – in a pan, add little oil. Add the cumin seeds. Once the seeds crackle, add the fennel seeds and coriander seeds. Roast for a few minutes. Add the cashew and raisins and cook again for 1-2 minutes. Add the onion, salt and allow It to cook. Add the dry coconut, turmeric powder, red chilli powder, garam masala, grated raw mango, potatoes and cook for 1-2 minutes. Take the dough and divide into equal portion ball.Roll each ball into thick puri. Divide the puri into two portions with a knife. Take one portion and fold it over giving it a cone shape. Press the other end on top to stick two ends to each other. Take a pan and heat the oil. 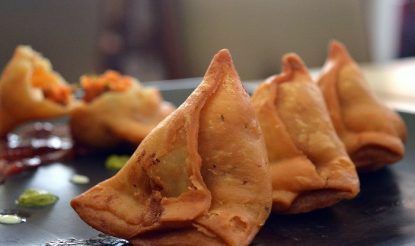 Fry the samosa. You could also bake it in the oven. Serve hot with Kairi Kanda Chutney.